ORLANDO, FL -- Photo opportunities saved the day on this trip, as that was the only outside activity I could enjoy in 28 degree temperatures. Not your typical day in Florida to be sure. 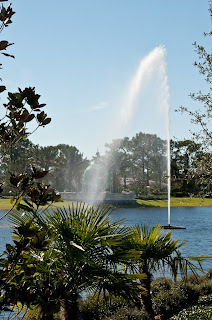 Luckily the lake hadn’t started to frost over yet, so the fountains were a willing subject against the beautiful blue Florida skies. Playing with various shutter speeds, it was easy to get just the intended look of action, blurring and sharpness. To give the right amount of blur, this shot was taken at 1/45 second, f27 and ISO200 on my Nikon D300. One note of caution when taking photos of high altitude fountains…..watch out for changing wind directions. When the fountains shoot water as high as they do, a change in direction can carry those droplets hundreds of feet, drenching you and your expensive camera. This week, we were staying in the brand new Parc Soleil Suites by Hilton Grand Vacations. Located just minutes from all the Disney Parks, at 11272 Desforges Avenue, this ultra-new property has much to offer. Beautiful pools, water slides, basketball and tennis courts abound. Dozens of eateries are but minutes away by car and are easily reached without the traffic congestion so often encountered on International Blvd. Parking is abundantly available in 3-story interior garages in each building.